Sonya is headed to Culpepper for the HITS. Northern Candlelight is a 8 yr old dark bay 16.2 hh mare that has been in my training program since she was 4 years old. 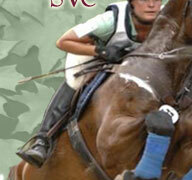 As with all my young horses, she has been cross-trained, showing in Hunter, Horse Trials, and Jumper classes. She has a natural aptitude for jumping, which coupled with a courageous and generous heart has allowed her to be successful in all three disciplines. She loves competing in Horse Trials as her elegant movement and bravery crosscountry resulted in ribbons at each competition. She loves the challenge of the Jumper classes and enjoyed the excitement of jumping against the clock. Most of all, however, she excells in her Hunter classes, garnering good ribbons in the Pre-Green and Low divisions, both over fences, and in the under saddle classes. She has even been happily shown by a lovely 13 yr old child in the Childrens Division. As she has a great temperment and doesn't mind sharing her wisdom with my students, I have taught lessons on her and leased her out to amateurs and children alike. She is eligible this year for 2nd year Pre-Green and certainly has the scope and step to carry on to the 1st years and Jr/Ami's.